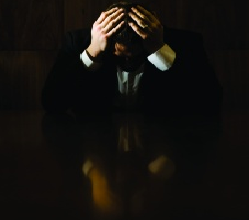 A few years ago a report by Beaton Consulting found that lawyers were the profession most at risk of depression. Long hours, high pressure, deadlines and the complexity of the work all add to stress levels that can lead to depression. The death of Robin Williams has once again brought depression into the headlines this week but the tragedy may spur others to seek help. Dan Lukasik is the managing partner of US law firm Bernhardi Lukasik and is also the founder of website Lawyers with Depression. Lukasik had seen his father battle with post traumatic stress disorder following military service and has suffered with depression himself for around 15 years. He took a huge risk by ‘coming out’ as a lawyer with depression some years ago and despite being told it would lose him clients, the reverse happened as clients saw a genuine human quality in him. In an audio interview he describes his battle with the illness and why so many lawyers are victims. Lukasik says a pessimistic way of thinking that begins in law school is where it starts and when added to a typical lawyer’s perfectionism and the stress of the job creates a cocktail of negative factors. He urges anyone feeling the pressure to get help. Just two months after expanding its Asia-Pacific footprint by opening in Myanmar the Wong Partnership has formed an alliance in Indonesia. The Singapore-based firm has entered into an agreement with Makes & Partners which means they now cover four of the ASEAN nations having formed a partnership with a Malaysian firm last year. The Canadian Bar Association is calling on regulators to allow non-lawyers to own law firms in the country. It’s been 13 years since New South Wales changed the rules on ownership and other jurisdictions have followed. Canada’s legal system is in danger of lagging behind the rest of the developed world if its business model is not allowed to modernise. Speaking to the Financial Post, CBA President Fred Headon says that Australia and the UK have seen new ways of running law firms and “the sky hasn’t fallen in". Canada has a high proportion of one-man firms but updated rules could allow greater consolidation, public listings or alliances with accountants and other service firms. Lawyers in the US have a constitutional right to publish comments from judges praising them for their work; in fact they can even use them in advertising! A lawyer in New Jersey challenged a ruling that attorneys could not use quotations from judicial opinions to promote themselves. The New Jersey Supreme Court ruled that lawyer Andrew Dwyer could not use an excerpt of the judge’s comments without including the whole of the opinion. Mr Dwyer sued the court system and the Court of Appeals has sided with him. by Graham Hill 15/08/2014 10:13:00 a.m.